Now that I’m in a plane en route to Hong Kong, I finally have time to reflect upon Qingdao (pronounced cheeng-dow), a city of nearly eight million people that feels refreshingly uncrowded compared to most big Chinese cities. 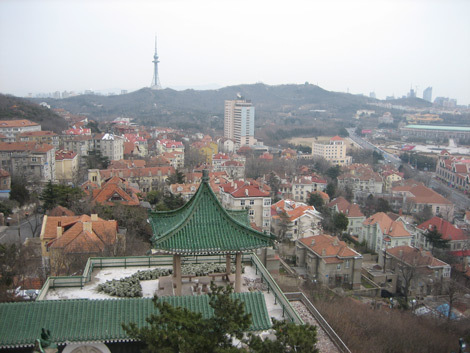 Located across from South Korea on the Yellow Sea, Qingdao is a rapidly expanding port city known for its pleasant maritime climate, clean beaches, excellent seafood (spicy clams, seafood wonton, roasted squid, etc. ), hilly streets filled with German-colonial architecture, massive apartment complexes with idiosyncratic names like Ideal City and International Mansion Settlement, and, of course, a healthy obsession with beer. Fly here after conquering the well-trod tourist trails of Beijing (just one hour and 15 minutes away) and you’ll experience a completely different side of 21st-century China. Discover seven quintessential Qingdao experiences after the jump. Stay at the city’s best hotel, the Shangri-La, which offers rates as low as $222 for a 405-square-foot Superior Room. Eat at one of the dozens of seafood restaurants lining Yunxiao Road Gourmet Street, Minjiang Road Gourmet Street, or Maidao Seafood Street. Bring your suntan oil and hit the beach during high season (May through October) – Qingdao has six beaches, the most popular being Number 1. Visit the smaller beaches (Numbers 2 and 3) to get away from the crowds. Pick up Chinese souvenirs and devour delicious street food at the Tai Dong night market, which opens at around 5pm every day. Head to the 7th and 8th floors to challenge locals to a game of billiards. Check out Xiaoqingdao Island (aka Lute Island), which is dotted with black pines, cypresses, flowers, and cherry trees (visit in the spring to see them in full bloom) connected to the mainland by a thin strip of land. If you can’t wait for Octoberfest in Germany, head to the Qingdao International Beer Festival, which kicks off on the second weekend in August and lasts for 16 days. Teetotaling? Go in May for the Clam Festival.